President of the Iran Policy Committee, Professor Raymond Tanter, was interviewed on 21 May on Al Jazeera’s The Stream about the United States moving to delist the main Iranian opposition that rejects clerical rule as a “terrorist” group. Check out the video below or see the original link from The Stream’s website here. 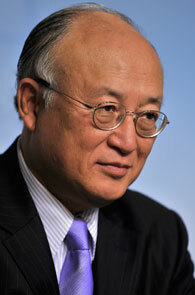 Head of the UN nuclear watchdog agency, Yukiya Amano, made premature remarks about “progress” in getting Tehran to discuss inspections of what may be a nuclear weapons trigger. Eager for “good news,” the Western media became overly optimistic about the 23-24 May 2012 Baghdad Talks between the Iranian regime and the major powers.Underlying this hopefulness is that diplomacy is buying time and hence delaying any plans for Israel to launch attacks against Iranian nuclear sites. Iran rejects a new package of proposals put forward by the powers, seeks to get into a “proposal-counter proposal” process, and reverts to its pattern of “talking about talks.” Iran demands sanctions relief and a wider agenda, while the major powers insist on discussing Iran’s nuclear file without such relief at this stage. Not surprisingly, the two sides agreed to hold a fourth round of talks in Moscow on 18-19 June 2012. In the context of endless negotiations, the military option arises again as the default alternative. But what about a third option—regime change from within Iran—in addition to placing added emphasis on the military alternative as the May Baghdad round of diplomacy failed like prior rounds in Geneva during December 2010 and Istanbul in April 2012? Critics answer that before regime change can occur, Iran’s “zone of immunity” from attack will increase as it uses time to make nuclear sites relatively invulnerable to attack. But the Islamic Republic is already using “diplomatic time” to become more immune to airstrikes, while the regime change clock is barely ticking. To accelerate regime change from within requires Jerusalem and Washington to have friends in Tehran, which is the topic of an article Raymond Tanter wrote as an op-ed for the 22 May 2012 Jerusalem Post, a slightly revised version of which appears below. As Prime Minister Binyamin Netanyahu pulls main political groups into a wall-to-wall coalition, he is in position to choose either military attacks on Iranian nuclear sites or to wait for international sanctions and covert action to compel Tehran to cease progress on a nuclear weapons capability. At issue, however, is whether these are the only alternatives available. A third option involves regime change from within Iran, of the kind to make less likely pursuit of nuclear weapons capability. Such an approach requires Jerusalem and Washington to have friends in Tehran. While the enemy of my enemy might still be my enemy, assume for the moment the conventional wisdom is correct: An enemy of the Iranian regime is a good candidate to be a friend of Israel. In fact, the main Iranian dissident group that rejects clerical rule in Tehran, the Mujahedeen-e-Khalq (MeK), reaches out to Washington and does not oppose Israel. By contrast, the Iranian Green Movement faction, headed by Mir Hossein Mousavi, accepts clerical rule and has a history of anti- Israel activities, such as calling for it to be annihilated. As the U.S. State Department decides whether to remove the MeK from its terrorist list, the drive to be delisted would benefit from a push from the pro-Israel community. Because delisting would send an implicit but unmistakable signal to Tehran that regime change from within is on the table, one would think the pro-Israel community would be active in the fight for removal of the MeK from the list. But there is no sign of the community’s influence in the delisting process. The community, however, is very active in the sanctions process. 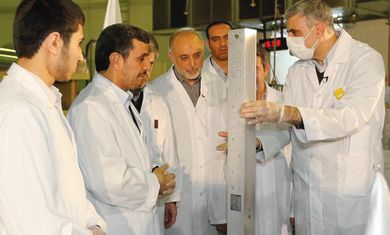 In contrast, the MeK opposes Iranian production of nuclear weapons; and to back up its words, the MeK reveals Tehran’s covert activities to procure uranium enrichment and weaponization equipment. In issuing blockbuster intelligence on Iranian progress toward nuclear weapons capability, the MeK laid the framework for international sanctions imposed on Iran. There is an assumption among pundits of an alliance of convenience between Israel and the MeK, but it rests on thin evidence of unnamed officials and an Iranian intelligence agent, Massoud Khodabandeh. Allegations of a covert alignment works in favor of those who would keep the MeK on the U.S. terrorist list, weakening its ability to help build a coalition to remove the clerical regime from power in Tehran. While uncertainty about such an alignment may reinforce Israel’s deterrent posture vis a vis Iran, it may be only a Pyrrhic achievement in view of costs incurred in inadvertently maintaining the MeK on the U.S. terrorist list. In a research trip to Iraq during 2008, I reported on interviews and documents that corroborated a tight relationship between the MeK and the US military in Iraq, but not with American diplomats. In addition, I reported how Iran’s Ministry of Intelligence and Security (MOIS) spreads false narratives about the MeK, some of which US diplomats echo. In October 2011, MeK-supplied information reinforced U.S. intelligence to expose Iran’s Islamic Revolutionary Guards Corps-Quds Force for plotting to assassinate the Saudi Ambassador to the United States and blow up the Saudi Embassy in Washington. That disclosure reinforced additional sanctions the U.S. Treasury placed on the IRGC-QF three days earlier. And what is Tehran’s response when confronted with evidence of its complicity in the assassination plot? The Ministry of Intelligence and Security blamed Israel and the United States, while also claiming MeK involvement. To its credit, the State Department promptly denied MeK responsibility, accused Tehran of “fabricating news stories,” and of spreading “disinformation” to exploit skepticism about the plot. While it might make some strategic sense for Israel to remain silent about any involvement with the MeK and sit on the sidelines in the group’s effort to be removed from the U.S. terrorist list, there is no excuse for the pro-Israel community to refrain from seeking removal of the MeK from the list and helping to allay suffering of its supporters in Iraq, who languish under prison-like conditions, hoping to be resettled in friendly countries rather than forcibly repatriated to Iran. The State Department has said it was looking favorably at delisting the MeK if it continued cooperating by vacating a former base inside Iraq, called Camp Ashraf, to another location, Camp Liberty. There are about 1,200 MeK members remaining in Ashraf and some 2,000 already in Liberty. But the fly in the ointment is that the State Department also said it might still rule against delisting the MeK if evidence turned up of a capability and intent to commit terrorism in Ashraf after complete relocation to Liberty, a condition described by former U.S. military commanders as “absurd,” because they supervised inspection of Ashraf, it was under American military control from 2003-2009, and Iraqi military monitoring and control thereafter. Such a condition is a virtual invitation for Iranian agents to plant weapons in Ashraf, which then could be used by the State Department as indicators of capability and intent for the MeK to commit terrorism. It is in this final phase of decision making at the State Department where the American pro-Israel community might make a difference, but it sits quietly on the sidelines of an epic struggle: whether Israeli and U.S. policy should include not only talks, sanctions, and threats to take military action but also a “regime change from within” option for Iran. The writer was a frequent Visiting Professor at the Hebrew University of Jerusalem, is Emeritus Professor at the University of Michigan, and former member of the Senior Staff of the National Security Council in the Reagan-Bush administration.